Laura Underhill Norment grew up in New Bern, NC and has been involved with horses for over 25 years; since her first riding lesson at the age of eight. She showed locally both in the ponies and children’s hunters before attending boarding school in Virginia and college at UNC Chapel Hill. After college, she entered the intercollegiate riding world at St. Andrews College in Laurinburg, NC as a working student. She continued in the college riding world with jobs teaching, riding, IHSA coaching, training and barn managing at Goucher College, in Baltimore, MD and at the University of Virginia/The Barracks in Charlottesville, VA. Laura spent two years on the road at A-rated horse shows in Illinois, Mississippi, North Carolina, Virginia, and Maryland as the manager of the Saddlers Row’s mobile tack store. She then returned to graduate school at East Carolina University where she earned a Masters in Business Administration in July 2003. 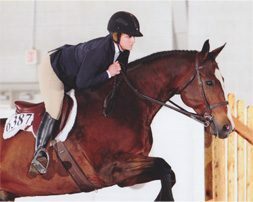 She returned to St. Andrews in August 2003, where she served as a faculty member in Equine Studies, instructor, and Show Team coach until June 2006, when she decided to devote her full energies to Graham Place. Laura has been a member of the Board of Directors of the NCHJA and has served as co-chairman of the Association’s Annual AA Rated Horse Show. Laura is a USEF “R” judge for Hunters and Hunter Seat Equitation and AQHA Specialty Over Fences Judge and actively judges shows all over the United States. She competes on the USEF and AQHA circuits including the QH Congress and World Shows. In 2016, Laura and her family purchased 18 acres in New Bern, North Carolina to complete her dream of owning her own barn. Graham Place is currently located in it’s forever home on Airport Road in New Bern.